Moremi Game Reserve is considered to be one of the most beautiful game reserves in Africa, and is the perfect Okavango safari destination for those who want to discover the beauty of the African bush. Many people talk of Moremi Game Reserve as if it was a different area from the Okavango Delta, when in fact the Moremi Game Reserve falls completely within the Okavango Delta. In fact, the Moremi Game Reserve makes up about 20% of the Delta. It is the only area within the Okavango where you can see the Big Five on your Botswana Safari, as Rhino have been reintroduced onto Chief's Island.It is often cited that it was the first Game Reserve created by the indigenous population. This is true, as it was the first region officially created as a reserve at the behest of the local tribes. The land belonged to the BaTawana people and in 1962 Chief Moremi's wife saw that the local wildlife was being decimated by the hunters and created the Moremi Game Reserve. The Reserve covers large tracts of the central and eastern areas of the Okavango. It is dominated by Chief's Island which was the BaTawana's Chief's main hunting ground in historic times. The region is vast with areas of permanent floodplains as well as drier seasonal areas. The reserve was created so that every type of habitat in the Okavango could be conserved. It includes Chief's Island which is the largest expanse of solid ground in the Delta. Moremi has one of the most diverse ecosystems in Africa. There are several major waterways in the area, and there are extensive flood plains.The Mopani Tongue in eastern Moremi is a dry triangle of land that juts into the Delta area between the Khwai and Mogogelo Rivers. Each side is 40km long and the corners are roughly marked by South Gate, North Gate and Xakanaxa Camp. This is the only area of the Reserve that can be accessed on a self-driving safari. The area is covered with thick Mopani forests. There are large tracts of Mopani in the Reserve which are called "cathedral" Mopane because they are tall and their arching branches mimic the arches in a cathedral. The major rivers are boarded by thick riverine forests with Camelthorn, Silver Terminalia and Seringa trees. As Moremi Game Reserve is so big it has a vast range of habitats which supports a great diversity of animals. There are large herds of Elephants year round and the waterways are home to numerous Hippo. The vast tract of solid dry land on Chief's Island and in the eastern parts of the reserve mean that there are large numbers of antelope such as Burchell's Zebra, Blue Wildebeest, Impala, Kudu. Tsessebe, Reedbok, Waterbuck, Bushbuck, Duiker, Steenbok, Giraffe, Baboons, Vervet Monkeys and Warthogs. You may even catch a glimpse of Sitatunga deep in the areas of permanent swamp on your Botswana safari.On the predator front, Moremi is famous for being home to large numbers of the endangered African Wild Dog, also known as the Painted Hunting Dog. The Okavango is home to over 30% of the world's remaining population. Other predators found in the Moremi Game Reserve include Lion, Leopard, Cheetah and Spotted Hyena. Black backed and Side striped Jackals are also commonly seen. Smaller predators in the area include the beautiful spotted cats such as Servals and Caracals. During night game drives on your Botswana safari you may see Aardvark's and Aardwolf's. These nocturnal animals are hard to find and are usually found in the drier areas of the reserve. In the drier areas of the reserve you can see Bat Eared foxes as well as a number of species of mongooses including, Banded, Dwarf, Slender, Large Grey, Water and Selous Mongooses. The deep water channels and lagoons are home to several species of otters including Cape, Clawless and Spotted Neck Otters. The Reserve is home to over 400 species of birds. The Moremi Game Reserve protects a large proportion of the Okavango and there are many regions that are vitally important to many species of birds. The reserve is home to many rare species of birds, the most important being the Slaty Egret, which is found in shallow reed-filled, and quiet backwater lagoons. Another critically endangered species that finds sanctuary here is Wattled Cranes. Other interesting species to look out for are Bradfield's Hornbill, Coppery Tailed Coucals and Pink Throated Long-claws. As this is a government reserve there are very strict guidelines as to the activities that can take place. You can only do day game drives in the reserve, though some of the camps on the edge may offer night drives in areas that lie outside the reserve. Game viewing by boats is not possible as the Khwai River is not wide enough. The camps in this area are open year round. This is one of the only areas of the Delta that guests can self-drive on their own Moremi safari. This can only be done in 4x4 vehicles, and most self-drive guests come in the dry winter months, as the roads can become water logged, making travel difficult in the summer months. There are only limited areas of the Moremi Game Reserve where you can self-drive. If you are flying into one of the camps, then your travel will not be restricted. As with most areas of the Okavango, you will probably see more wildlife in the winter months between May and September. This is also the time when the annual flood arrives. 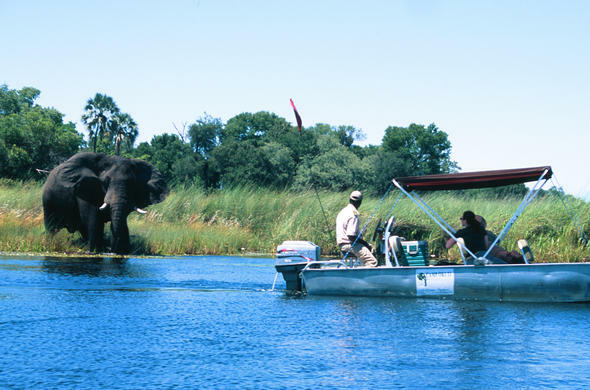 There are areas of permanent water around most camps in Moremi, so you can enjoy water activities year round.